My new studio is mostly complete (just needs a ceiling). Definitely ready for someone to get to work! Now I have heat and light after three years of cold and dark. 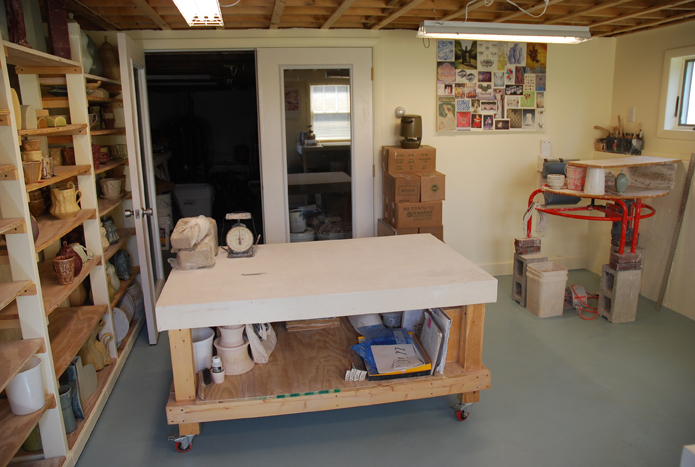 What you are seeing is a small (15 x 15′) addition to our basement, where I used to be. A small move, but a BIG improvement! Very nice. I like these spouses that lend in the fulfillment of dreams! I hope you are in there working today! Your studio looks wonderful, so clean and bright. I’ve just painted the floor in my studio, and it’s made such a difference for the amount of dust. So much easier to clean. I love all of your shelves and windows:). Wow! nice clean organized … Is it always like that? My guess it is immaculate with few exceptions. Geez i remember taking your throwing class an you hardly get your hands dirty. That looks like a beautiful place to work. lots of light and space to move around. Have fun! PS I’m taking a class with Michael Kline this summer… I’ll let you know how it goes. Your space looks awesome and I love the light you get! I love a clean and organized studio myself. Key to being organized for me is to have a place for everything. I find myself so productive when the studio is clean. You are going to have so much fun working in this space. Wow, your new space is beautiful, so bright, wish I was close by I’d definitely stop by. 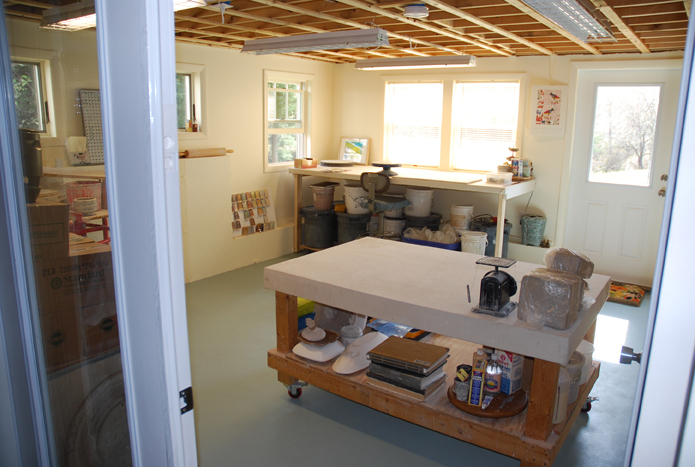 i do love new space, time to dive in now and make some lovely new clay work.. This is a mighty fine example of a well thought out studio! Nice! There are so many things I wish I had done when we began our studio. Now, it’s been so many years in the same space with so much stacked pell mell on itself, it is almost impossible to imagine a new ideal space. We’re already looking at a five-year plan… in hopes that we can expand our space and make things more to our liking! Thanks for setting such an awesome example. Thanks for your thoughtful note, Alex! Obviously, the inconveniences and less-than-ideals are not pictured. 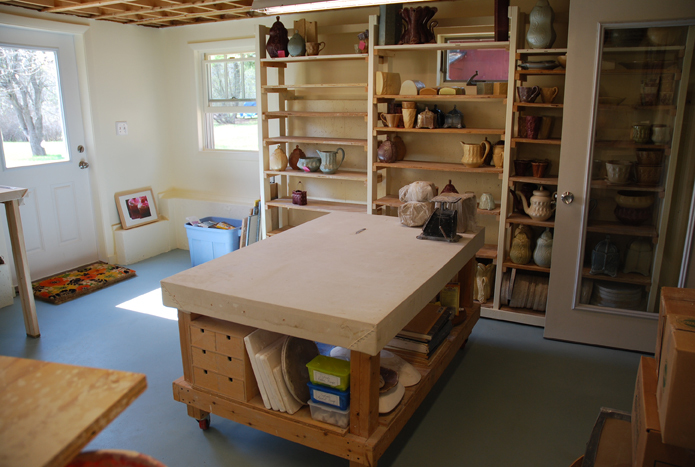 The things that prove to be the most important for me are ware shelving (a’la OU, each of those shelves can be removed and carried to the kilns, or taken out to make room for taller work), higher work surfaces (for back and neck health) and as much as possible on wheels (for space flexibility). Setting up a space is tricky business. We all work differently too, so have different needs. It’s fun and exciting though! Wow…that space is so “dreamy”! So bright and clean…(my dream). I hope you have many great days of creating wonderful things in that space. I can’t wait to post some photo’s like that some day.